Since even really stupid, useless dogs can be wonderful companions, it stands to reason that especially intuitive dogs can effectively help people cope with the most devastating kinds of psychic trauma. 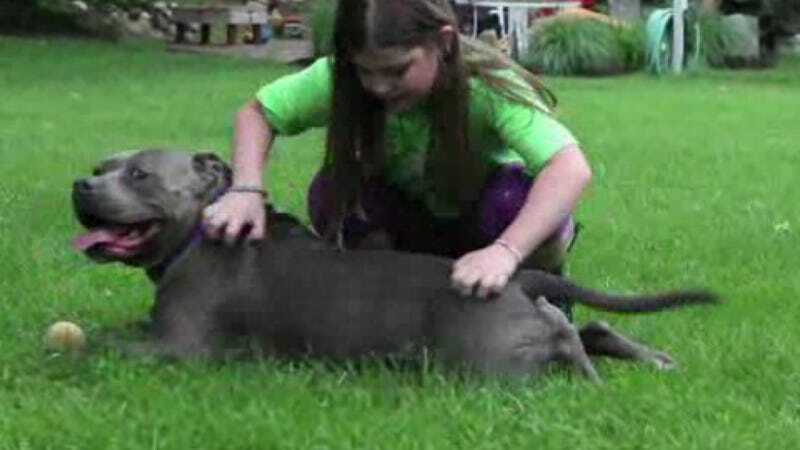 Jeffrey, a nine-year-old Staffordshire terrier that was hours away from being euthanized when he was rescued and discovered to be a naturally-gifted therapy dog, had such a calming effect on Emma Wishneski, a girl who will soon enter the fourth grade at Sandy Hook Elementary. When Jeffery’s owner Michele Houston brought him to Christmas party for students at Sandy Hook, he formed an immediate bond with Emma, who, according to a story from Today, stayed with the 73-pound therapy pit bull throughout the entire event. Although Emma was fortunately late to school the morning of Dec. 14, the shooting claimed the lives of several of her friends and teachers. In the wake of that shock, meeting Jeffrey had an immediate impact on Emma. The two quickly formed a bond at the Christmas party, and she stayed with him throughout the entire event. "It was still a really vulnerable time for her, and she just was comfortable sitting next to Jeffrey," said Emma's mother Marykay Wishneski. "He's strong and I think she just feels safe." It’s just like The Fox and the Hound, only in reverse, i.e. all the bad stuff happens in the beginning, and all the good stuff happens in the end.